"Chiropractic for kids? I didn't even know that was a thing. Why would they need that?" It's the most common question we hear when we say one of the focuses of our practice is pediatric chiropractic! 1. From the time of conception until the age of 2 years old, your nervous system goes from absolutely nothing at all to more than 50% of the nervous system fully developed. This means that these 2 years of life (plus time in mommy's belly) is a BOOM in nervous system growth! During this imperative period of nervous system development, it's crucial to ensure that it's developing and making connections properly! 2. Quite simply put, birth is TOUGH! Whether you birthed vaginally or by the even tougher Cesarean section, it's all a rough ride for mom and baby alike and can greatly affect the positioning of a child's spine! Beyond birth, we know that accidental tumbles, spills, and bumps that are all a part of growing up can all have a detrimental effect on a child's spine if left uncorrected. Think about a car with poor alignment- what happens to your tires? They wear unevenly. Similarly, this happens with your spine when a misalignment is left uncorrected for an extended period of time. This misalignment doesn't just inhibit proper development of the boney spinal structure, but also the development of the nervous system itself, much of which is housed within the spinal column. When the nervous system isn't developing and functioning properly, we can see a variety of health concerns arise. And if a simple chiropractic "check up" can prevent from this improper development, why take the risk not getting checked? The second most common question we get: "Is it even safe?" Often times, babies (or tuckered out older kids) sleep right through their adjustments because it's just that gentle! Most parents don't even realize the difference between us feeling the spine and the actual delivery of the adjustment. 1. The ligaments, tendons, and bones of each joint aren't fully developed yet in a young child. Because of this, they are much more easily "moveable" and therefore simply don't take as much force to shift back into alignment. 2. The average age of a person's first chiropractic adjustment isn't until the age of 43. Bearing in mind what we said earlier, that a great deal of spinal misalignment and dysfunction begins as early as birth, then that means that these misalignments have now had 43 years to form a pattern in your body. This causes ligaments/tendons/muscles to become chronically contracted, making it more difficult to shift back into the position it should be in. But when we are able to catch these subluxations at a much younger age, we aren't having to fight against chronically-contracted soft tissues and therefore don't have to exert nearly as much force! Continue reading below to see some of the most common reasons families bring their little ones to see us, as well as patient experiences! Breastfeeding is tough. But roadblocks shouldn’t cause you to stop entirely! 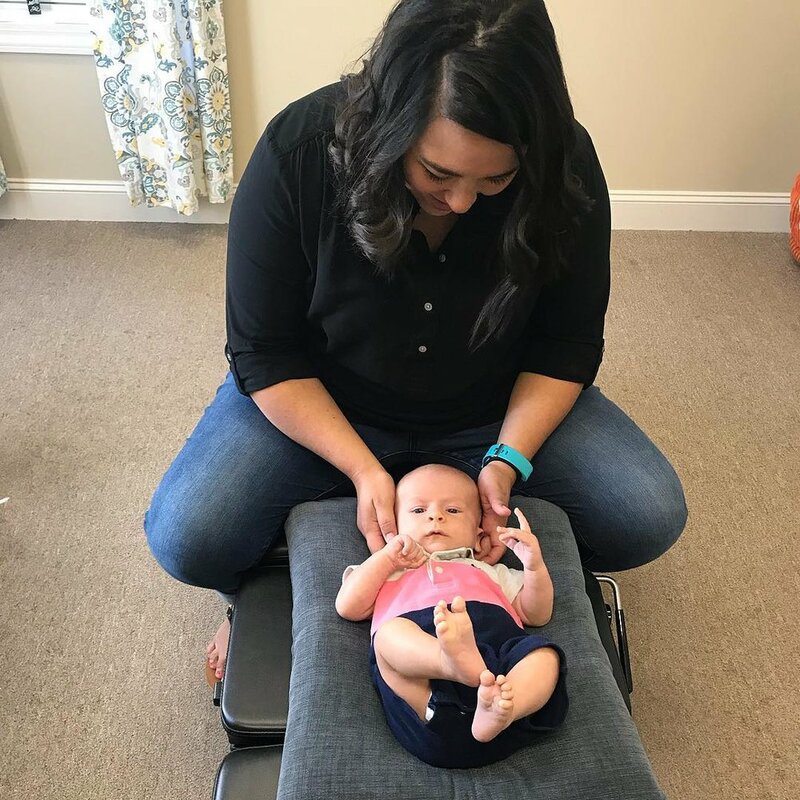 With many things to consider when it comes to a successful breastfeeding relationship, consider nervous system and spinal alignment to be a big piece of the puzzle! Click the link below to learn more and to hear Logan’s story. Ear infections are no fun; they’re common, but they are NOT normal. If your child finds themselves with recurring ear infections; if you’ve been down the road of multiple antibiotics (perhaps too many to count) or are even considering getting tubes (or already have), you’ll want to click the link below to learn more and to hear from Raelyn’s mom. When it comes to sensory processing disorder, ADHD, and autism, there are multiple pieces to the puzzle. If this is your child, click below to learn more about the importance of the nervous system in your child’s processing functions. So many young infants are being prescribed medications to control these symptoms. If you’re looking for another option to address your child’s reflux and excessive spit up and gas, click below to learn more and to hear from Avery’s mom. It’s incredibly common for our parents to have to do a blow out diaper change by the time they get home (sometimes before they can even leave the office). Click below to learn more about why this happens, and to hear from some happy parents. If your little buddy isn’t sleeping well, it can be miserable for the entire family! Proper sleep is imperative for all function, so click to hear how chiropractic has helped many families in our community find better sleep for their little ones and for themselves. Your child deserves to play outside and not have to worry about the seasonal and environmental allergies! Click to hear how chiropractic has impacted Trey’s allergies! Tightness and decreased range of motion are directly related to the status of our nervous system and spine. This can cause different issues for different babies: hating tummy time, difficulty breastfeeding, dislikes baby wearing…and much more. Click to hear more and to hear from Scarlett’s mom.